An iron pillar near Delhi (India) is sometimes quoted as an out-of-place artefact, although it is not easy to see why. Set up in its present position by King Chandragupta II Vikramaditya (c 376-415 CE), it stands a little over seven metres high with an average shaft diameter of 0.4 m and weighs about six tonnes. Most sceptics therefore give its age as around 1600 years old, as opposed to the 4,000 years claimed, for instance, by Erich von Däniken. The mystery of the pillar consists of its largely uncorroded condition, despite standing exposed to the elements for at least 1,600 years. This has more to do with the purity of iron from which the pillar was made than with any unusual technology. The story does get a little more complicated, though, because of confusion over the name of the pillar and the precise identity of the pillar for which the claims have been made. Emperor Aṣoka Vardhana (c 273-232 BCE) is known to have erected polished pillars throughout his kingdom, topped with regal lions that watched the four corners of his realm. The lions stand on a Buddhist wheel of life. These pillars are made from stone and the example in Delhi (at Firozshah Kotla, near Delhi Gate) was put in its present position by Firuz Shah (Sultan of Delhi 1290-1296 CE); it is more properly known as a Singh Stambh (‘Lion Pillar’). 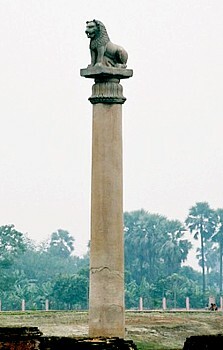 The controversial ‘Aṣoka pillar’ in Delhi is not one of Emperor Aṣoka’s pillars but was transported from Meerut and installed close to where the Bara Hindu Rao Hospital now stands, near Delhi University, presumably by Chandragupta II. It does get worse, of course. 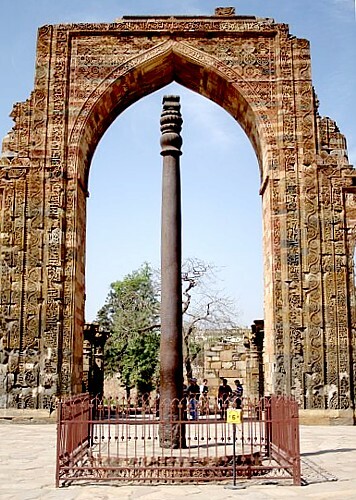 The photograph that is usually shown of the ‘Aṣoka pillar’ is not of it at all, or even of the example moved from Meerut, but is of an iron pillar in the Qutb Minar mosque near New Delhi. The mosque was built by Qutb al-Din Aibak (1150-1210) following the first Islamic conquest of Delhi by Mu‘izz-ud-Din Muhammad ibn Sam of Ghur (1162-1206) in 1193 and located in the centre of the earlier twelfth-century Hindu fort of Rai Pithora. Standing in the courtyard of the mosque is an iron pillar 7.21 m high (although fringe writers quote its height as anything between 10 and 12 m), tapering from 0.41 m in diameter at its base to 0.32 m below the capital and weighing six tonnes; it bears an inscription to the same King Chandragupta II who erected the Singh Stambh and probably also dates from c 400 CE. It is believed to have been brought in 1052 from Muttra by Anang Pal (died 1180), a leader of the Rajput Tomaras. As with the Singh Stambh, the pillar in the Qutb Minar has remained rust-free. Chemical analysis of the pillar has shown the iron from which it is composed to be low in sulphur and manganese; this purity is also believed to account for its uncorroded condition. The best ‘mystery’ that Bad Archaeologists can generate from these pillars is “[t]he possible use of some metallurgical secret ingredient or process… yet another reminder of ancient techniques being lost or forgotten”. Thin stuff indeed! I’ve spent a lot of time reading this website after spending even more time reading about spirit channelers and alien interventions and it is very refreshing to come across on these subjects. However the tone towards the end of this article seems to imply that there are no unanswered questions about the pillar, how it was made, or why there are few or no other examples of this type of iron. Is that because those questions have been answered or is it because when dealing with pseudoscientists and their tendency to latch on to anything that doesn’t quite fit with current understanding and use it as proof that SCIENCE IS WRONG, there is a temptation to respond by saying SCIENCE KNOWS ALL, even in areas where that isn’t 100% true just to shut them up (and win an argument). I would also be very interested in your opinion on the supposed underwater settlements of the coasts of Cuba, India and Japan that I’ve seen ten year old news reports on but nothing since. More examples of bad archaeologists going straight to the press? Or is there something to them? Also is there anything out there that is genuinely anomalous or that can’t be explained using our current understading of history? I second this request…my favorite thing about anomalous artifacts has always been the sense of mystery they generate in my mind, and it has seemed to me that most “OOPArt” proponents have entirely missed the point of these things by immediately claiming to have some other non-conventional answer. Your explanations I find much more credible, though I am sometimes jarred into doubting your objectivity by the occasional snark at “Creationists.” They are annoying and stuff, for sure, but it seems like your animosity would certainly leave you reluctant to be objective with a real enigma, if you thought it might leave them an opening. I hope that your obvious love of science would preclude your hate of Creationists. But screw ’em, we know they’re wrong, and they will never admit it. So give…have you come across something that is really anomalous?